Tag Archive | "food franchises"
Ecuador’s food is health food… compared to food in the US… even Ecuador’s fast food is pretty good. 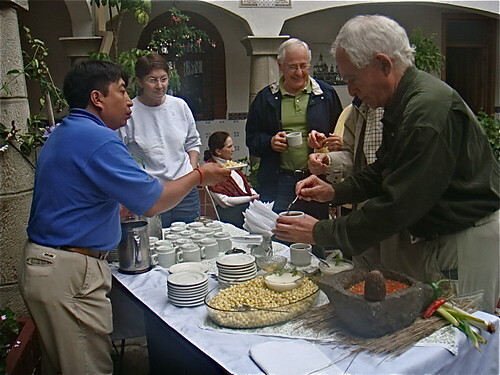 Many mistakenly think that Ecuador food is something like Mexican food. Nothing could be further from the truth. 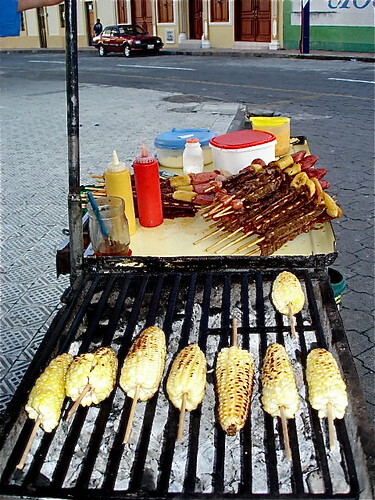 I have never seen a taco or antijito in Ecuador, although they are available in the big cities in chains. 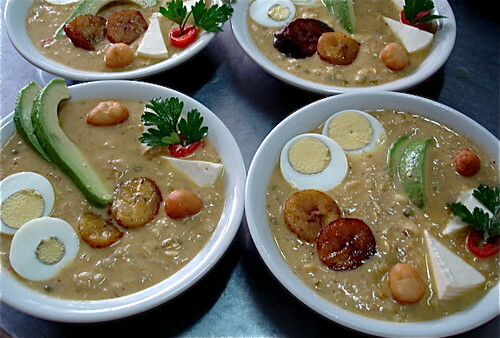 Ecuadorian food is European if anything but blended nicely with Andean traditions… so it comes out darn healthy. 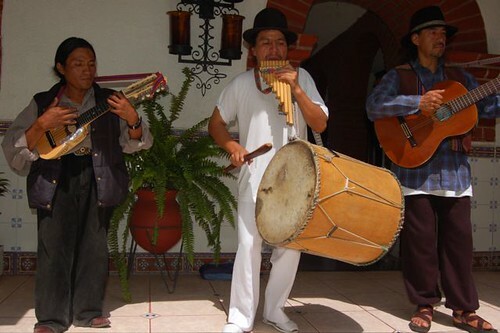 While in Cotacachi last week we visited with many friends and readers who have moved to Ecuador and heard a similar refrain… “I lost 22 pounds without even trying”. One delegate who has moved to Cotacachi about six months ago reported losing 38 pounds. 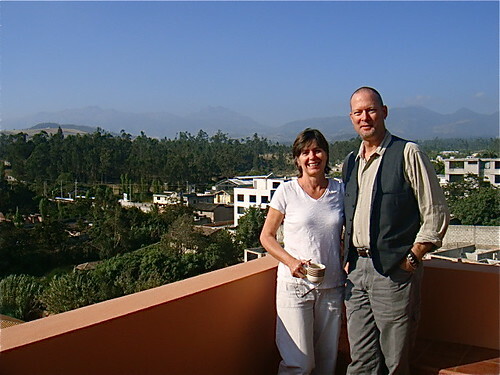 We visited our well known international friends, Dan Presher and Suzan Haskins, at their new Cotacachi condo. They were both looking so good, I asked their secret. “We just lost weight without trying” was their reply. Plus many report that shedding stress helps as well…. along with walking in the fresh mountain air. 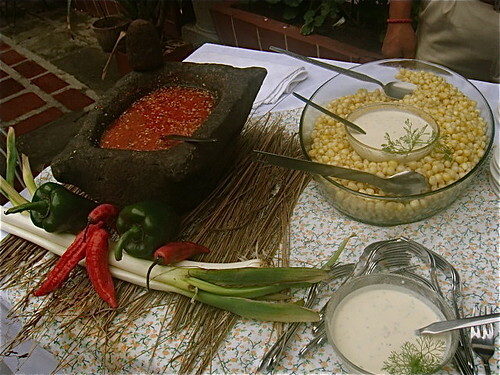 Ecuador food is fresh. 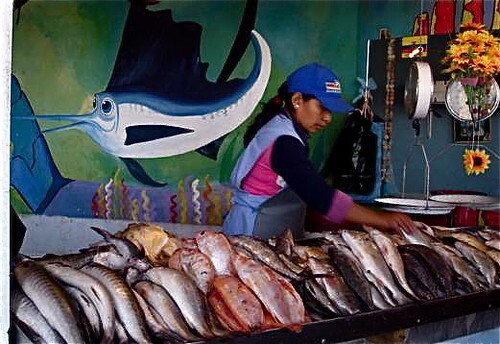 On Ecuador’s coast, you can get seafood right from the fishing boats when they come in, like these fresh food shoppers at San Clemente . Boats like this one just outside the hotel where we have our condos are dotted along the coast. 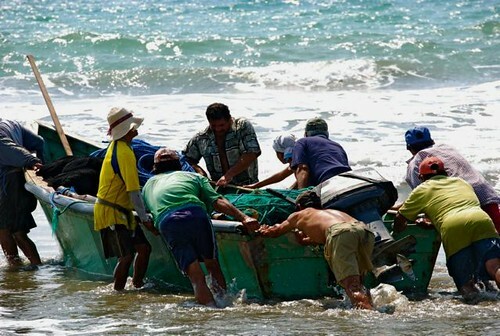 The fishermen handle the boats through the surf. Then they head out to sea! Merri and I meet the fishermen when they return with shrimp and fish and some langostinos. 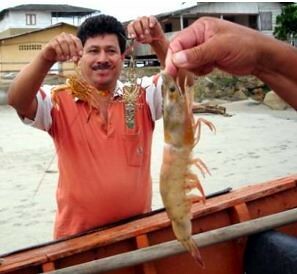 The shrimp are large enough that two provided a meal! 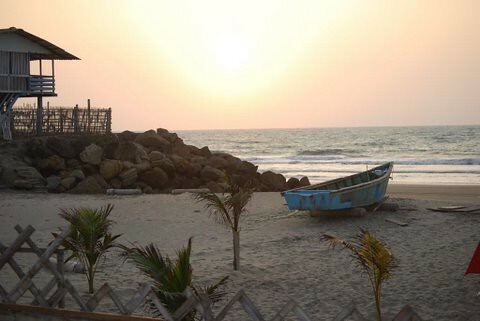 The Humboldt Current creates one of the world’s most productive nutrient-rich waters that rise along the coast. This is a perfect condition for abundant plankton which leads to an eco region that teems with huge schools of small fish like anchovies and sardines. The cool waters of the Humboldt Current provide a constant supply of food for big fish such as Dorado (coryphaena hippurus – also called dolphinfish), barracuda (sphyraena indiastes), blue and black marlin, yellow-finned and long-finned tuna (thunnus albacares, thunnus alalunga), snook and many other species. Here I am in San Vicente with dorado just north of Manta and adjoining San Clemente. 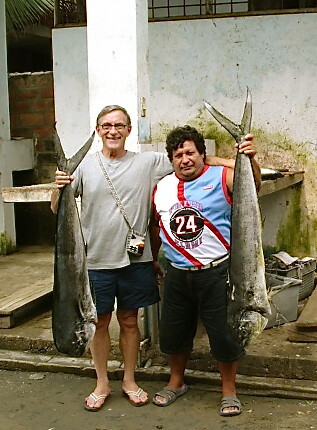 Four world-record Pacific bigeye tuna (similar to yellow fin tuna) catches come from Ecuador ranging in size from 236 pounds to 375-pounds. 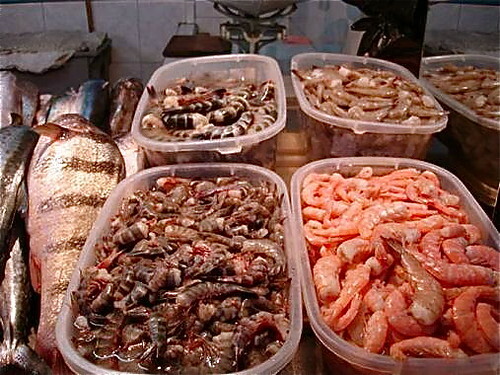 Sea food includes Stripped Marlin, Tuna, Grouper, Wahoo and Corvina (seabass). 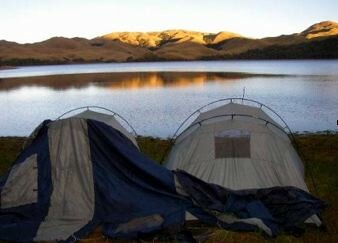 Trout is in the rivers and lakes of the Andes like this high country lake . 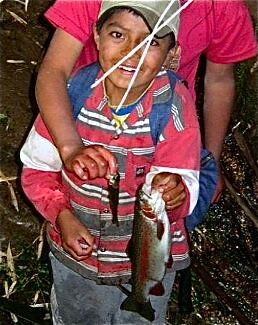 Trout grow well in the Andean Highlands above 7,000 feet, with average water and air temperature virtually constant year-round. The trout feed on scuds, leeches, small fish and various bugs. Even the seafood in the Andes is fresh. 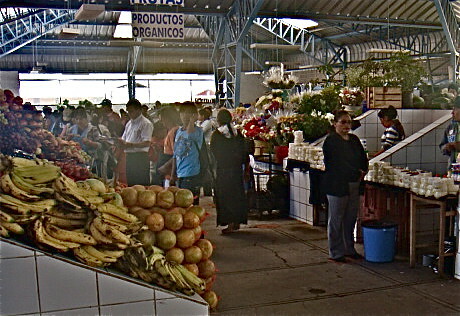 Here is the Ibarra fish market were they bring the fish in overnight. 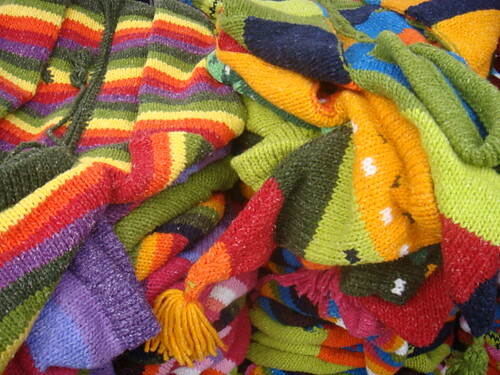 Prices are really low… mostly about a dollar a pound. Plus there is Quinoa, a full protein grain of the Andes. 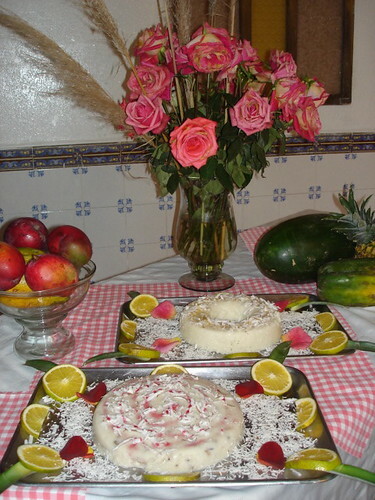 We make our cake and bread gluten free and packed with protein at Meson de las Flores. Here is one of our chef’s quinoa cakes with a fresh coconut pudding. There are no high fat, fast food franchises in the area. 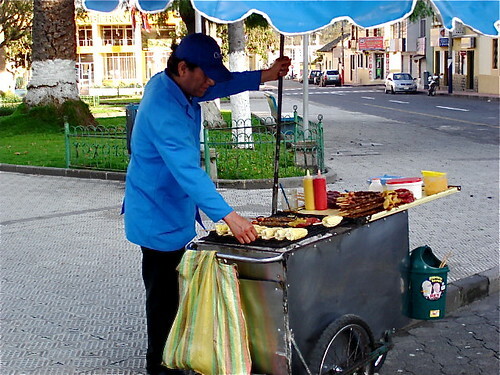 This is as close to a fast food as you’ll get in Cotacachi. Much better than a Big Mac!…corn roasted on a grill. 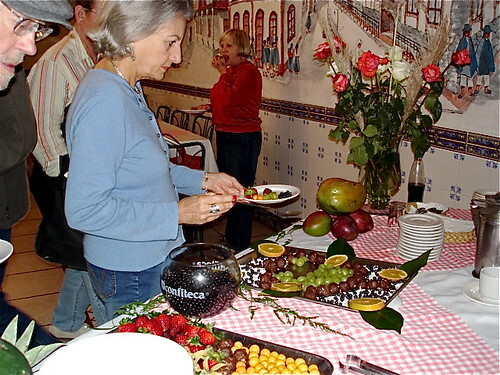 Fruit is vine picked ripe and really cheap… every type… tropical and northern… apples, blackberries, cherries, strawberries and pears. For those interested in healthier nutrition, here are three nutritional tips sent to us by our friend Blaine Watson. A diet high in turmeric may help reduce weight gain by suppressing the growth of new fat tissue, according to a study conducted by researchers from Tufts University and published in the Journal of Nutrition.The study was funded by the U.S. Department of Agriculture and a grant from the Higher Education Commission of Pakistan. “Weight gain is the result of the growth and expansion of fat tissue, which cannot happen unless new blood vessels form, a process known as angiogenesis,” senior author Mohsen Meydani said. “Based on our data, curcumin appears to suppress angiogenic activity in the fat tissue of mice fed high fat diets.”Curcumin is an antioxidant chemical in the polyphenol family that naturally occurs in turmeric. 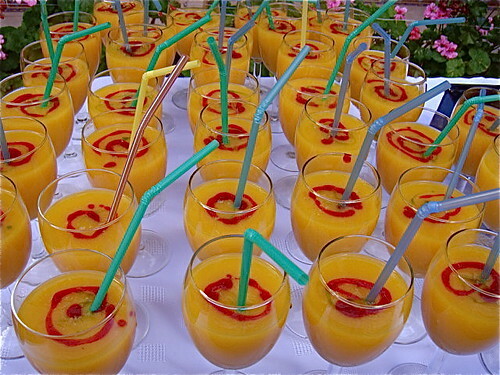 In contrast to some phytochemicals, it is easily absorbed by the body. Researchers fed two groups of mice identical high-fat diets, supplementing the diets of the half the mice with 500 milligrams of curcumin per kilogram of body weight per day. They found that mice in the curcumin group had significantly lower blood cholesterol and significantly less microvessel density in fat tissue than the mice in the control group, implying less blood vessel growth and thus less overall growth of fat tissue. The livers of mice in the curcumin group also contained significantly less fat than those of the mice in the control group. “In general, angiogenesis and an accumulation of lipids in fat cells contribute to fat tissue growth,” Meydani said.The researcher also noted that “curcumin appeared to be responsible for total lower body fat in the group that received supplementation.”In a similar study conducted on cells rather than animals, the researchers also found curcumin to suppress angiogenesis. The chemical also appeared to suppress the expression of two genes linked to angiogenesis in both the mouse and cell experiments. I wanted to remind everyone that turmeric is to be used with some degree of awareness. We never eat it raw. It must be cooked in our food. Capsules are therefore not an option. We use only organic turmeric. The regular turmeric you buy for example in an Indian store is heavily adulterated with chalk and talcum powder and food coloring. We also use turmeric sparingly. 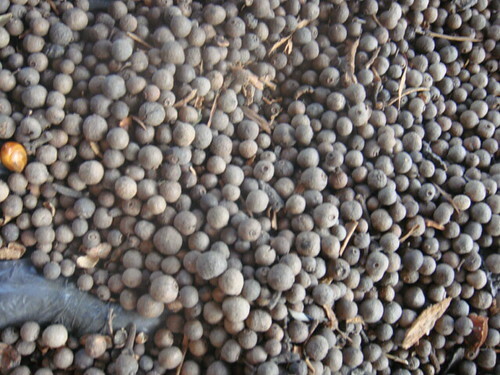 It is highly highly effective in purifying the liver. The North American/Western diet and lifestyle is highly toxic with many many sources of impurities which are metabolized and stored in the liver. When turmeric is introduced to the diet these toxins/impurities are squeezed from the liver (this would be a contributing factor to weight loss) and this is a good thing but not if it is overwhelming to the body. 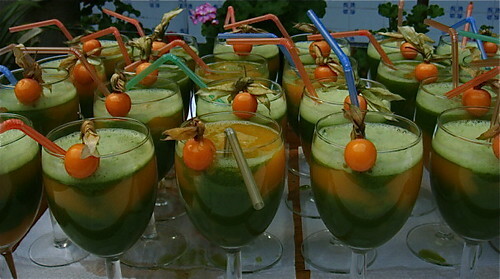 Detox crisis is a real possibility. 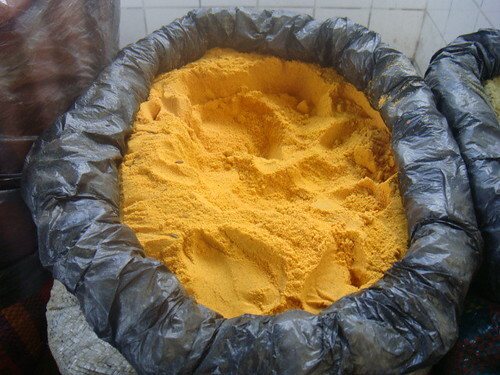 Here is turmeric sold in the Cotacachi market. The national drink of Ecuador is herbal tea… not espresso cafe… real infusions made from the fresh plants purchased in the market. Much healthier… even medicinal! 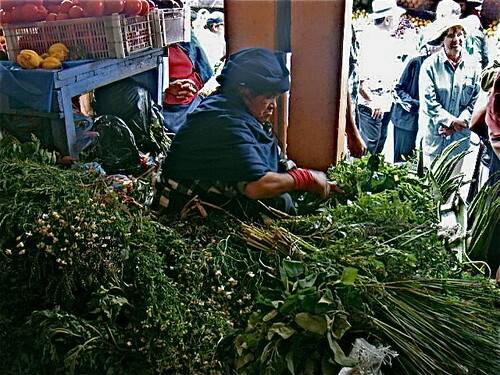 Here are teas being sold in Otavalo market. 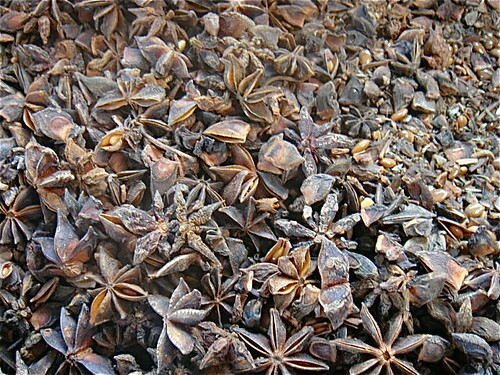 Here is star anise great for making Tea-Masala. 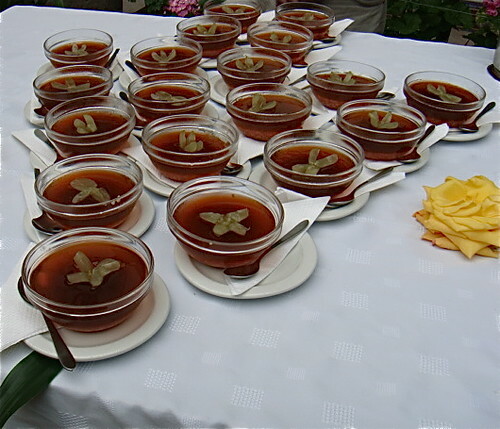 Here is a traditional shamanic purification tea to be drunk and bathed in. One part sweet pepper pictured here (called black cardomon in the US). Boiled with cinnamon bark and chamomile. so much healthier than coffee and doughnuts! 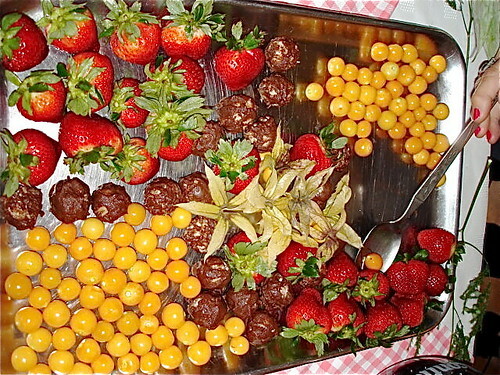 This coffee break has fresh fruit… gooseberries and hand made chocolate dipped, coconut balls. even the coconut is fresh and hand shredded. I have the staff make us a few extra as they do not last long! 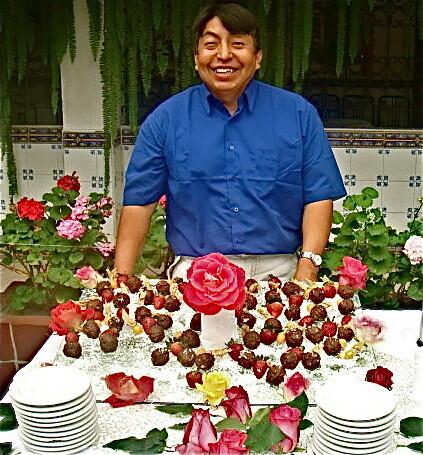 or do Eduardo’s fresh strawberries dipped in Ecuador chocolate. 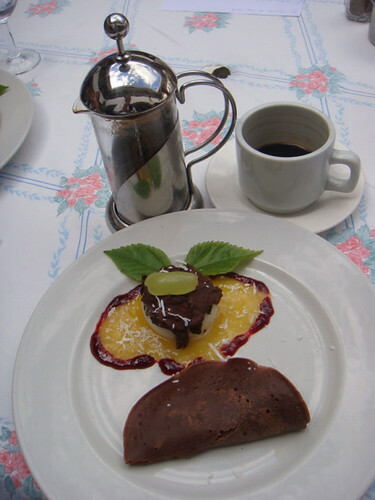 On the subject of chocolate, my favorite desert is this chocolate pancake… yet we lose weight eating here! The qunioa welcome cake is our chef’s specialty. The hotel’s food is fresh. 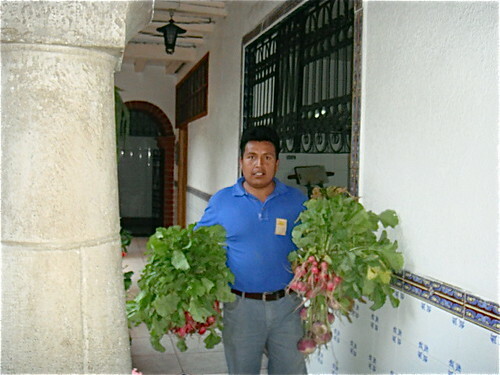 Here Meson’s manager Franklin Sandoval brings in just picked veggies fresh from the market. 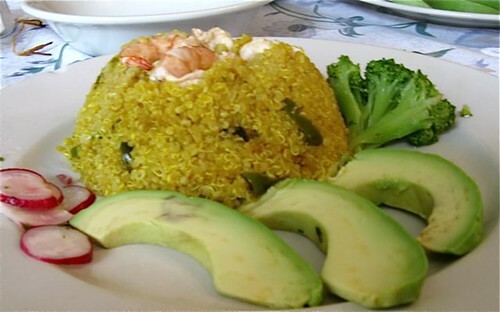 A typical high protein meal, quinoa, avocado and shrimp. 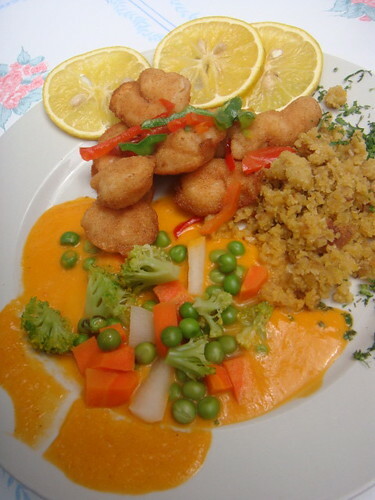 Here is a variation on the theme… shrimp… with quinoa and vegetables “al dente” in a carrot sauce. 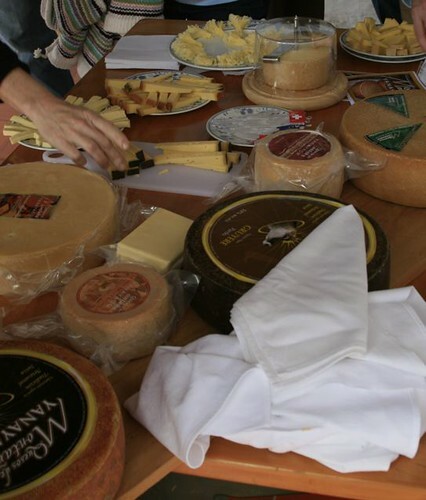 Organic Swiss cheese is produced near the hotel. This holiday soup is made with 12 grains, fish, egg and avocado. 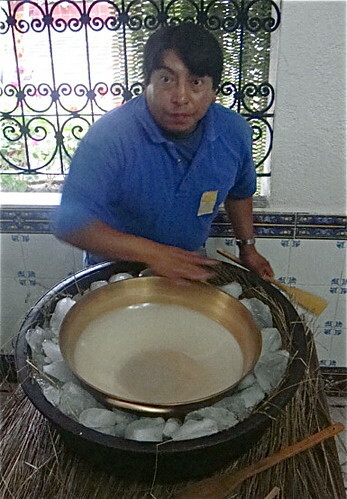 ice cream, are hand made from fresh cream and fruit juices by the staff. 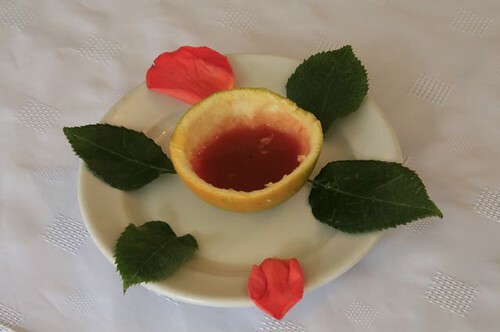 Plus the care that the staff put in the service and the food… catsup is hand made and never delivered in a bottle but in a hollowed out fruit. 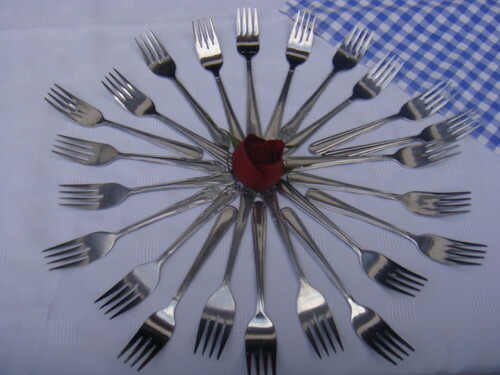 arrangement of forks. 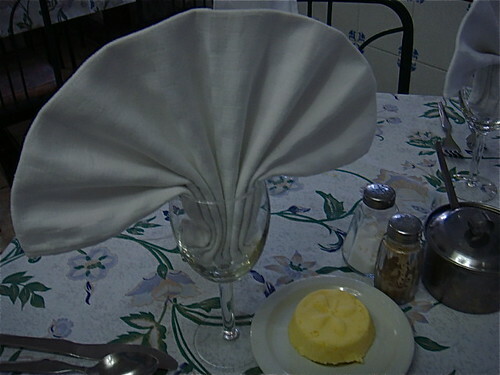 The staff are always thinking of ways to make your food a bit more delightful. 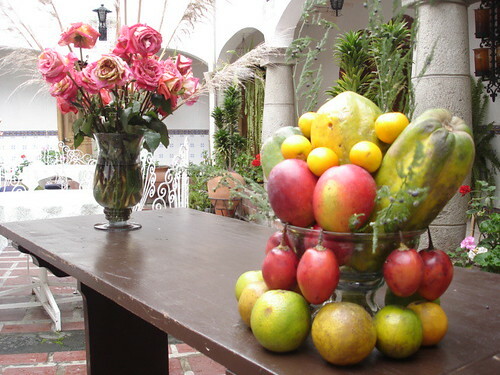 So of health and better nutrition… you do not need to think Ecuadorian health food… just eating Ecuador food can be enough!